Fan Engagement – has a real ring to it doesn’t it? 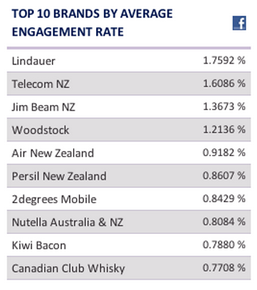 Following up to yesterdays post, I’m now going to look at the top NZ brands on Facebook and compare them to our most engaging brands, our most trusted brands and the most engaging brands on Facebook in the US. Interesting side note: The All Blacks were left off this list despite have 1.8 million fans. I guess rugby teams aren’t brands??? More on this later. 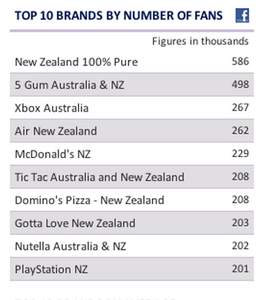 As you can see, there are stark differences between the top brands by numbers and the top brands by engagement with only Air New Zealand and Nutella (Aus & NZ) truly engaging with their large number of fans. What does this tell us? Numbers aren’t everything! Just ask Barack Obama. If anyone figures out how to engage with fake Twitter and Facebook accounts , let us know. To add a further factor of interest, not a single brand from New Zealand’s Most Trusted Brands list appears on either of these facebook lists. This shows us you don’t have to be the well known knight in shining armour to engage with people online, you just have to know how to do it right. 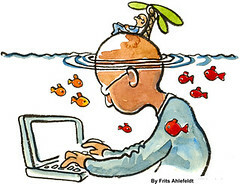 So lets focus on the most engaging brands on facebook as the more realist statistic on social media success. In the Top 10 most engaging brands in New Zealand we have four alcoholic drink companies, two foodstuff companies, two communication network providers, one airline and we can’t forget Persil NZ washing detergent. Compare those brands to the most engaging facebook brands in the United States we see a huge difference. Leading the way are five television networks, followed by one sporting event (non US), one supermarket, one alcoholic drink company, one restaurant and one motorcycle manufacturer. Its safe to say that if Kiwis have a drinking problem then Americans have an even bigger television problem. So we now know who is engaging the most with their fans. The next question is, how are they doing it?? Tomorrow we will put two brands from each list head to head in our ‘Battle of the Brands’ feature to showcase different ways to engage with your fan base. See you then. https://creativeagencysecrets.com/wp-content/uploads/2014/04/CAS_Logo_1line_RGB.jpg 0 0 Rob Lane https://creativeagencysecrets.com/wp-content/uploads/2014/04/CAS_Logo_1line_RGB.jpg Rob Lane2012-10-02 11:35:592012-09-24 18:58:29Fan Engagement - has a real ring to it doesn't it?